There was only one tiny side window in which we could all see about half the class at any one time. There may have some polite shoving involved. I don't really remember. We were all very excited. I was never into dance growing up. Not that I wouldn't have been, it's just that I grew up in a small town in South Dakota and I don't think that dance classes were a super high priority. I'm pretty sure I could have found a class in my town on learning how to drive a tractor, how to properly wrestle a calf or maybe even How To Apply Crisco While Tanning on Barn Roofs. But dance... not so much. Now, however, I have found myself the parent of a little girl who is creating a tutu situation around here that is a little ridiculous. My husband and I recently decided that maybe we needed a place to channel some of her frilly, twirly energy before our house explodes into a cloud of tulle and ribbons and fancy shoes and they never find our bodies. 1. 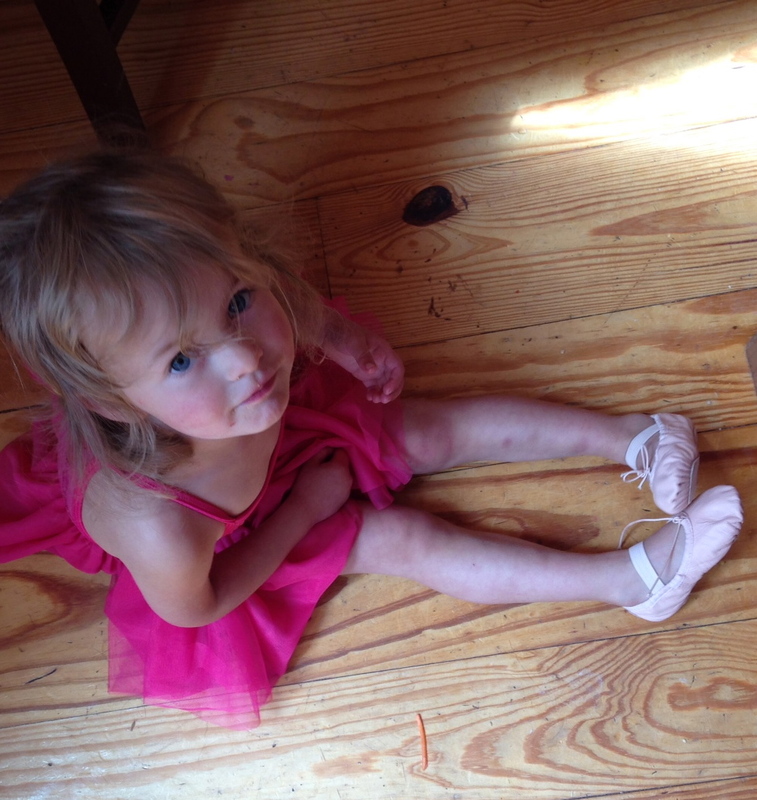 That I would need to take out a second mortgage or sell a kidney in order to buy not only ballet AND tap shoes, but also the hot pink leotard tutu concoction that became lodged in my daughter's vise-like grip at the local dance store. Note to any other mothers out there thinking of taking their child into a store specifically made for dance: Don't. 2. That I would underestimate my daughter's attachment to her new dance things. After putting on the entire ensemble once we got home, including tap shoes, she began to fall, repeatedly, on our wood floor because of the slippery shoe bottoms. Eventually, I said, "Maybe you should take your tap shoes off so you don't break you bottom today." But, in her desperation to continue to wear the super fancy, future-head-injury-disguised-as-a-pair-of-shoes, she said, "I'll just crawl Mom! See! I like crawling!" 3. That I would soon realize why the dance instructor briefly allowed the parents in the dance room to help put on our children's tap shoes and take a couple of pictures and then politely told us to get the heck out. The kids would have never been able to hear the Frozen soundtrack over the audible swooning and the, Oh my Gawds!!! and, They are so cutes!!! and the, Look at them tap their darling little tap shoes'!!! 4. That the first dance class might turn the mothers into women that they didn't quite recognize. There was only one tiny side window in which we could all see about half the class at any one time. There may have some polite shoving involved. I don't really remember. We were all very excited. 5. What an amazing bargaining tool the hot pink tutu concoction would be. Getting a 3-year-old to listen to all of the words that are coming out of your mouth is challenging. Unless you have leverage. That dance dress has become the ultimate leverage. "If you throw your brother's art project all over the room because you are angry at him, you are choosing to lose your dance dress," or, "If you continue to make going to bed into an MMA Fighting Championship, you are choosing to lose your dance dress," or even, "If you continue to talk to me in a voice that only dogs can hear, you are choosing to lose your freaking dance dress!" 6. How she would tell everyone, including every checkout person that we saw, our garbage lady, or anyone accidently making eye contact with her, about her "Dance Party" and her "New dwess that twirls and sparkles!" And is, of course, hand-wash only. 7. That I would need to make a deep investment into Woolite, because I am going to be hand-washing that thing every day of my life. 8. That my daughter would start to creep me out a little standing there in the dress, hip jutted out, head at a weird angle, talking in an even higher falsetto than her normal voice, saying, "I am a pweeetty pwincess! Aren't I mommy? Say it! Say I'm pwetty pwincess!" 9. And well, the cuteness. Oh my gawd.